اثباتی, امیرحسین, ایرانی, سعید. (1396). مدل سازی چند مقیاسی شکست در نانوکامپوزیت پلیمری تقویت شده با نانولوله‌های کربنی سالم و عامل دار شده. 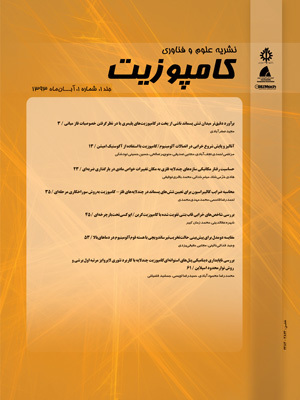 علوم و فناوری کامپوزیت, 4(1), 35-46. امیرحسین اثباتی; سعید ایرانی. "مدل سازی چند مقیاسی شکست در نانوکامپوزیت پلیمری تقویت شده با نانولوله‌های کربنی سالم و عامل دار شده". علوم و فناوری کامپوزیت, 4, 1, 1396, 35-46. اثباتی, امیرحسین, ایرانی, سعید. (1396). 'مدل سازی چند مقیاسی شکست در نانوکامپوزیت پلیمری تقویت شده با نانولوله‌های کربنی سالم و عامل دار شده', علوم و فناوری کامپوزیت, 4(1), pp. 35-46. اثباتی, امیرحسین, ایرانی, سعید. مدل سازی چند مقیاسی شکست در نانوکامپوزیت پلیمری تقویت شده با نانولوله‌های کربنی سالم و عامل دار شده. علوم و فناوری کامپوزیت, 1396; 4(1): 35-46. در این تحقیق تلاش شده است، عوامل موثر بر خواص مکانیکی و مکانیزم شکست نانوکامپوزیت پلیمری تقویت‌شده با نانولوله‌های کربنی سالم و عامل‌دار شده مورد ارزیابی قرار گیرد. مدل‌سازی در دو فاز نانو و میکرو انجام‌شده که اثر نقص‌های ساختاری حفره و پیوند‌های کوالانسی ناشی از فرآیند عامل‌دار کردن نانولوله‌ها در فاز نانو و نحوه توزیع، شکل و انحنای نانولوله‌ها در فاز میکرو نیز بررسی شده است. مشاهده می‌شود که با توجه به عواملی همچون توزیع، اعوجاج و عامل‌دار شدن نانولوله‌های کربنی، امکان کاهش یا افزایش استحکام نانوکامپوزیت‌های پلیمری در مقابل پلیمر خالص وجود دارد. همچنین عامل‌دار کردن نانولوله‌های کربنی باعث بهبود استحکام نانوکامپوزیت پلیمری شده و شکنندگی آن‌ها را کاهش می­دهد. از سوی دیگر، نقص­های ساختاری ایجادشده در پروسه عامل‌دار کردن نانولوله‌های کربنی، باعث کاهش مدول الاستیسته نانوکامپوزیت می‌شود. همچنین چنان‌چه انحنای نانولوله‌های کربنی تقویت‌کننده نانوکامپوزیت پلیمری افزایش یابد، اثر بهبود دهنده عامل‌دار کردن نانولوله‌های کربنی کاهش چشمگیری می‌یابد و به خواص نانوکامپوزیت تقویت‌ شده با نانولوله‌های سالم نزدیک می‌شود. In this research, mechanical properties and fracture mechanism of polymer nanocomposite reinforced by carbon nanotubes (CNTs) has been evaluated employing multiscale modeling method. Effect of CNTs’ structural defects and covalent bonds created during functionalization process are investigated in nanoscale analysis and the effect of CNTs’ dispersion, curvature and volume fraction are studied in microscale analysis. In microscale modeling both analytical and finite element methods are employed to investigate mechanical properties and their results are compared. It has been investigated that, according to mentioned parameters such as CNTs’ dispersion, volume fraction, functionalization and curvature in polymer matrix, both increase and decrease in ultimate strength of polymer nanocomposite are possible with respect to pure polymer. Moreover, polymer nanocomposite’s ultimate strength is increased and fracture brittleness is decreased significantly using functionalized CNTs. On the other hand, the CNT’s structural defects caused during functionalization process decrease polymer nanocomposite Young’s modulus. It also has been demonstrated that by increasing curvature, the improving effects of functionalized CNTs on mechanical properties of polymer nanocomposite, decrease obviously. Iijima, S., "Helical Microtubules of Graphitic Carbon", nature, Vol. 354, No. 6348, pp. 56-58, 1991. Mittal, G. Dhand, V. Rhee, K. Y. Park, S.-J. and Lee, W. R., "A Review on Carbon Nanotubes and Graphene as Fillers in Reinforced Polymer Nanocomposites", Journal of Industrial and Engineering Chemistry, Vol. 21, No. 0, pp. 11-25, 1/25/, 2015. Esbati, A. and Irani, S., "Failure Analysis of Cnts with Stone -Wales Defect Using Nonlinear Finite Element Method, Mechanics of Composite Materials", Vol. in Press, 2016. Goh, M. Park, O.-k. Choi, Y. M. Ku, B.-c. Lee, J. H. You, N. H. and You, H. S., "Post-Treatment Method of Carbon Materials for Improving the Electrical Conductivity and Mechanical Properties Via Dehydrocyclization Reaction and Polymer Composite Materials Comprising the Treated Carbon Materials", US Patent 9,040,015, 2015. Jiang, Q. Wang, X. Zhu, Y. Hui, D. and Qiu, Y., "Mechanical, Electrical and Thermal Properties of Aligned Carbon Nanotube/Polyimide Composites", Composites Part B: Engineering, Vol. 56, pp. 408-412, 2014. Ansari, R. and Rouhi, S., "Atomistic Finite Element Model for Axial Buckling of Single-Walled Carbon Nanotubes", Physica E: Low-dimensional Systems and Nanostructures, Vol. 43, No. 1, pp. 58-69, 2010. Ansari, R. Motevalli, B. Montazeri, A. and Ajori, S., "Fracture Analysis of Monolayer Graphene Sheets with Double Vacancy Defects Via Md Simulation", Solid State Communications, Vol. 151, No. 17, pp. 1141-1146, 2011. Yengejeh, S. I. Zadeh, M. A. and Öchsner, A., "On the Tensile Behavior of Hetero-Junction Carbon Nanotubes", Composites Part B: Engineering, Vol. 75, pp. 274-280, 2015. Bhattacharyya, A. R. Sreekumar, T. Liu, T. Kumar, S. Ericson, L. M. Hauge, R. H. and Smalley, R. E., "Crystallization and Orientation Studies in Polypropylene/Single Wall Carbon Nanotube Composite", Polymer, Vol. 44, No. 8, pp. 2373-2377, 2003. Jia, Z. Wang, Z. Xu, C. Liang, J. Wei, B. Wu, D. and Zhu, S., "Study on Poly (Methyl Methacrylate)/Carbon Nanotube Composites", Materials Science and Engineering: A, Vol. 271, No. 1, pp. 395-400, 1999. Wong, M. Paramsothy, M. Xu, X. Ren, Y. Li, S. and Liao, K., "Physical Interactions at Carbon Nanotube-Polymer Interface", Polymer, Vol. 44, No. 25, pp. 7757-7764, 2003. Haggenmueller, R. Gommans, H. Rinzler, A. Fischer, J. E. and Winey, K., "Aligned Single-Wall Carbon Nanotubes in Composites by Melt Processing Methods", Chemical physics letters, Vol. 330, No. 3, pp. 219-225, 2000. Qian, D. Dickey, E. C. Andrews, R. Rantell, T., "Load Transfer and Deformation Mechanisms in Carbon Nanotube-Polystyrene Composites", Applied physics letters, Vol. 76, No. 20, pp. 2868-2870, 2000. Liu, T. Phang, I. Y. Shen, L. Chow, S. Y. and Zhang, W.-D., Morphology and "Mechanical Properties of Multiwalled Carbon Nanotubes Reinforced Nylon-6 Composites, Macromolecules", Vol. 37, No. 19, pp. 7214-7222, 2004. Withers, G. Souza, J. Yu, Y. Cercone, L. Khabashesku, V. and Davis, D., "Improved Mechanical Properties of a Water-Activated Polyurethane-Glass Fiber Composite Reinforced with Amino-Functionalized Carbon Nanofibers", Journal of Composite Materials, 0021998315581510, 2015. Brcic, M. Canadija, M. and Brnic, J., "Multiscale Modeling of Nanocomposite Structures with Defects, Key Engineering Materials", Vol. 577, pp. 141-144, 2014. Shokrieh, M. M. and Rafiee, R., "Stochastic Multi-Scale Modeling of Cnt/Polymer Composites", Computational Materials Science, Vol. 50, No. 2, pp. 437-446, 2010. Ayatollahi, M. R. Shadlou, S. and Shokrieh, M. M., "Multiscale Modeling for Mechanical Properties of Carbon Nanotube Reinforced Nanocomposites Subjected to Different Types of Loading, Composite Structures", Vol. 93, No. 9, pp. 2250-2259, 2011. Zakeri, M. Shayanmehr, M. and Shokrieh, M. M., "Interface Modeling of Nanotube Reinforced Nanocomposites by Using Multi-Scale Modeling Method", In Persian, Modares Mechanical Engineering, Vol. 12, No. 2, pp. 11, 2013. Li, C. and Chou, T.-W.,"Failure of Carbon Nanotube/Polymer Composites and the Effect of Nanotube" Waviness, Composites Part A: Applied Science and Manufacturing, Vol. 40, No. 10, pp. 1580-1586, 2009. Fereidoon, A. Saeedi, E. and Hemmatian, H., "Perediction of Nanocomposite Effective Elastic Moduli by Finite Element Modeling in Micro Scale", In persian, Modares Mechanical Engineering, Vol. 13, No. 5, pp. 11, 2013. Esbati, A. H. and Irani, S., "Probabilistic Mechanical Properties and Reliability of Carbon Nanotubes, Probabilistic Engineering Mechanics", Vol. in Press, 2016. Mohammadpour, E. Awang, M. Kakooei, S. and Akil, H. M., "Modeling the Tensile Stress–Strain Response of Carbon Nanotube/Polypropylene Nanocomposites Using Nonlinear Representative Volume Element", Materials & Design, Vol. 58, pp. 36-42, 2014. Odegard, G. Gates, T. Wise, K. Park, C. and Siochi, E., "Constitutive Modeling of Nanotube–Reinforced Polymer Composites", Composites science and technology, Vol. 63, No. 11, pp. 1671-1687, 2003. Belytschko, T. Xiao, S. Schatz, G. and Ruoff, R., "Atomistic Simulations of Nanotube Fracture", Physical Review B, Vol. 65, No. 23, pp. 235430, 2002. Ma, P.-C. Zheng, Q.-B. Mäder, E. and Kim, J.-K., "Behavior of Load Transfer in Functionalized Carbon Nanotube/Epoxy Nanocomposites", Polymer, Vol. 53, No. 26, pp. 6081-6088, 2012. Hashin, Z. and Rosen, B. W., "The Elastic Moduli of Fiber-Reinforced Materials", Journal of Applied Mechanics, Vol. 31, No. 2, pp. 223-232, 1964. Odegard, G. M. Frankland, S.-J. V. and Gates, T. S., "Effect of Nanotube Functionalization on the Elastic Properties of Polyethylene Nanotube Composites", Aiaa Journal, Vol. 43, No. 8, pp. 1828-1835, 2005. Shokrieh, M. M. and Mahdavi, S., "Micromechanical Model to Evaluate the Effects of Dimensions and Interphase Region on the Elastic Modulus of Cnt/Polymer Composites", In Persian, Modares Mechanical Engineering, , Vol. 11, No. 3, pp. 12, 2011. Popov, V. Van Doren, V. and Balkanski, M., "Elastic Properties of Crystals of Single-Walled Carbon Nanotubes", Solid State Communications, Vol. 114, No. 7, pp. 395-399, 2000. Han, F. Azdoud, Y. and Lubineau, G., "Computational Modeling of Elastic Properties of Carbon Nanotube/Polymer Composites with Interphase Regions. Part Ii: Mechanical Modeling, Computational Materials Science", Vol. 81, No. 0, pp. 652-661, 2014. Mura, T., "Micromechanics of Defects in Solids": Springer Science & Business Media, 2013. Hill, R., "A Self-Consistent Mechanics of Composite Materials", Journal of the Mechanics and Physics of Solids, Vol. 13, No. 4, pp. 213-222, 1965. Esbati, A. H. and Irani, S., "Mechanical Properties and Fracture Analysis of Functionalized Carbon Nanotube Embedded by Polymer Matrix", Aerospace Science and Technology, Vol. 55, pp. 120-130, 2016. Huang, Y. Y. Hwang, K.-C. and Gao, H., "The Effect of Nanotube Waviness and Agglomeration on the Elastic Property of Carbon Nanotube-Reinforced Composites", Urbana, Vol. 51, pp. 61801, 2004. Shen, J. Huang, W. Wu, L. Hu, Y. and Ye, M., "The Reinforcement Role of Different Amino-Functionalized Multi-Walled Carbon Nanotubes in Epoxy Nanocomposites", Composites Science and Technology, Vol. 67, No. 15, pp. 3041-3050, 2007. Andrews, R. Jacques, D. Minot, M. and Rantell, T., "Fabrication of Carbon Multiwall Nanotube/Polymer Composites by Shear Mixing", Macromolecular Materials and Engineering, Vol. 287, No. 6, pp. 395-403, 2002.